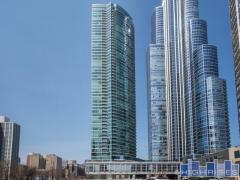 1629 S Prairie is a newer 32-story tower near Museum Park in the South Loop. You'll find luxury one, two and three-bedroom homes here with great views from floor-to-ceiling windows. Features include granite counters, cherry cabinets, central air, in-unit laundry, hardwood floors, private terraces and more. Building amenities include a fitness center, pool and 24/7 door staff. Have any comments or questions about Adler Place? Ask your question and/or share your thoughts about this Building.